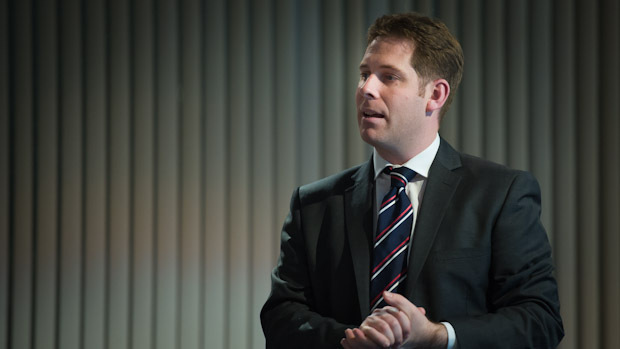 Kevin Knappett, First Secretary for Science and Innovation at the British Embassy in Japan, visited UNU Headquarters in Tokyo on Wednesday, 14 December, as a guest lecturer. His presentation, “Structure of the UK Research Enterprise”, focused on the strategies to encourage scientific research results to be transferred into industrial sectors for practical use. In an engaging talk, he actively encouraged the audience to think about the issues facing scientists and entrepreneurs in communicating invention and novelty to policy makers and the public. As the Science and Innovation section of the British Embassy in Tokyo aims to enhance collaboration between British and Japanese researchers and innovators, he particularly emphasized the connections between these two countries. Knappett discussed the value of sharing expertise and knowledge between nations, such as generating novel ideas and technologies in ways that a single nation alone would not have the capacity to develop. As there is no country in the world with enough scientists or resources to independently tackle the global challenges such as climate change or infectious diseases, the most fruitful form of research and enterprise requires bilateral or multilateral cooperation. The UK Science and Innovation Network has attachés in countries around the world, all of which are dedicated to collaboration in scientific sectors relevant to the host country. Collaboration can mean sharing educational facilities or equipment, jointly developing new technologies and releasing international research papers, and working in partnerships on developing new ideas. Knappett noted that collaboration allows countries to join together on mutual national priorities;, and to share in fields where both are particularly strong or in areas where one lacks expertise in a field that the other is advanced in. One result of successful collaboration, for example, is the research and development of the UK and Japan in the area of small satellites and aerospace science. On a broader level he noted that the UK historically has excelled in basic science research, a skill which it is important to keep, but has had a less successful record in developing technologies and business from such results. Collaborating with a country like Japan, which is renowned for its excellence in technological development and commercialization, therefore is mutually beneficial. In replying to a question on how such collaborations benefit wider society and global problems, Knappett highlighted that new solutions to societal problems and progress have been developed from innovations otherwise unrelated to civil society — one such instance being the use of small satellites for meteorological monitoring and disaster prevention. He maintained that though most scientific research, business development and technological production are not carried out for altruistic purposes, there are often serendipitous “eureka” moments in science and innovation that lead to unexpected benefits for societies. The lecture was an excellent opportunity for those involved to reflect on the role of UNU in its own research output and collaboration within international knowledge networks.